On July 11, a glamorous night of fundraising for the Padua Charitable Fund took place at the Philippine Embassy in London. British-Filipino actress and performing artist Rebecca Grant held an art exhibition, depicting West End and theatrical scenes from shows she has performed in. "An Actor's Art" exhibition successfully ran for two weeks at the Philippine Embassy, marking the 65th anniversary of Philippines-United Kingdom bilateral relations. Colourful paintings depict scenes from London productions. The fundraiser event (by way of a raffle) was held at the exhibition for the purpose of raising funds to sponsor the daily fares to and from school for 29 slum children in Eldorado Village. 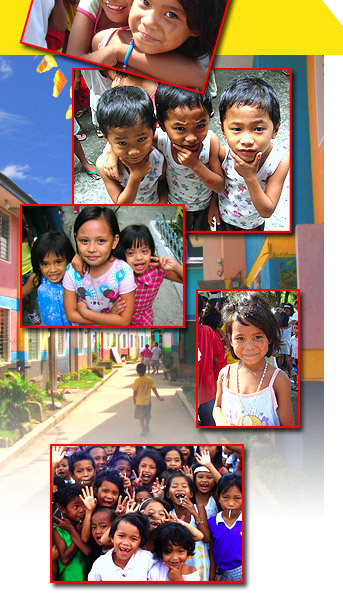 Without PCF sponsorship, these impoverished children end up not going to school. Rebecca with dancers Jemima & Sophie Padua & Nottm Philippine Youth Association. The event was graced by the ladies of Vivien of Holloway dressed in 1940s/1950s vintage reproduction attire, while exciting entertainment was provided by the Nottingham Philippine Youth Association cultural dance group, and little hip hoppers, Jemima and Sophie Padua. PCF raffle prizes included a commissioned painting by Rebecca, a £50-voucher from Vivien of Holloway and an exquisite double-stranded Philippine cultured pearl necklace. Hip hoppers Jemima & Sophie Padua & Philippine dancers from Nottingham. A total of £335 was raised and remitted to the Philippines. On 25th July, the school fare project commenced and within days, 29 marginalised children in the slums of Paranaque happily went to school. Donations for this project are ongoing. If interested, please contact us.